If you have never been to the summit of Mauna Kea, it is simply breathtaking. It feels, truly, like the meeting place of heaven and earth. The structures on the summit feel invasive and polluting. They are like an ugly stain on a beautiful, finely woven rug. To see them there is sad and painful, because they are so distinctly out of place and blights on an otherwise sublime landscape. The Thirty Meter Telescope is like proposing to place a large structure in Yosemite or the Grand Canyon. It’s akin to placing it on Mount Fuji or in the Sistine Chapel. To the many Hawaiians who honestly view the site with reverence, it’s such an entirely preposterous proposal it would be laughable it if weren’t so insultingly painful. The conflict is not science versus culture. It seems every time Hawaiians have legitimate concerns about the adverse effects a project may have on the resources we rely on for subsistence or cultural practices, the assumption is that we’re angry or anti-something. One of the telescopes on the summit of Mauna Kea. Why can’t it simply be that we’re just advocates for preservation, cultural resources, historic sites, sound conservation practices, and controls on development and urbanization? The reality is that the Hawaiians I know love science. We have been the original scientists and engineers of these lands for centuries. We just firmly believe that innovation should enhance resources, not harm them. In this world that feels obsessed with doing things first and fast, it feels like we are too busy asking ourselves what we can do and not often enough asking ourselves what we should do. Mauna Kea should have never been built on in the first place. It’s always been a sacred space and it is wholly unique in Hawaiian cosmology. I understand the importance of the site for research, but the hard reality is that the research can be done somewhere else, even if admittedly, not as well. Hawaiians have no other Mauna Kea. I have difficulty seeing how TMT is bringing enough benefit to Hawaii to justify the permanent desecration of a sacred site. So it is important that Hawaiians hold the line on this issue. And it is equally important that the University of Hawaii, as a self-proclaimed “Hawaiian place of learning” and extension of the State of Hawaii, walk away. The desire to destroy the mountain is not based on some humanitarian crisis or some great social need, they just want to do it. They want the newest, biggest machine. The problem is, as soon as they finish building it, they will be onto wanting something newer and bigger. We have over a dozen telescopes already on the summit as evidence of this, and we have decades of the university’s mismanagement of the mountain as precedent of its inability to respectfully manage this resource. I don’t mean to trivialize the importance of TMT’s scientific endeavors, but equally, if not more important, is the intangible cultural heritage of Mauna Kea. For hundreds of years, Mauna Kea has stood as an unblemished symbol of Hawaiian knowledge and cosmology. Astronomers believe there are great discoveries to be made “out there,” whereas Hawaiians believe there are equally great discoveries to be made right here. 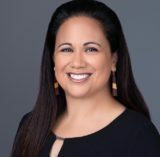 The University of Hawaii says it supports TMT “because it contributes significantly to the university’s mission of advancing knowledge.” Yet, not building TMT also allows for the pursuit of knowledge. I understand UH wants to “maintain Hawaii’s worldwide leadership in astronomy,” but Hawaii can also be a worldwide leader in preservation, conservation, and heritage. It is also unclear what Hawaii gains from its potential sacrifice. TMT is based in California, where the overwhelming majority of the funding for the project seems to be spent. The TMT International Observatory LLC is a partnership between the California Institute of Technology, the University of California, the National Institutes of Natural Sciences of Japan, the National Astronomical Observatories of the Chinese Academy of Sciences, the Department of Science and Technology of India and the National Research Council (Canada). UH is not even a member of this partnership-based LLC. TIO LLC brought in $57,620,363 in receipts alone for 2016, with the vast majority of its expenditures appearing to be spent outside of Hawaii. Most of the project’s leaders are based in California. Looking at salaries alone, very little money, if any, is actually coming to Hawaii. In this respect, Hawaii’s role is rather limited and it would not be impossible for UH to step away from the project. 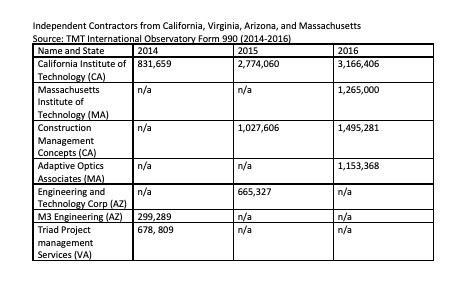 Additionally, the TMT International Observatory, LLC has contracted millions to universities and contractors in California, Virginia, Arizona and Massachusetts. While I understand the economy is important, I have difficulty seeing how TMT is bringing enough benefit to Hawaii to justify the permanent desecration of a sacred site. Based on their own reporting, a lot of high-paying jobs are being created in California and a lot of contract work goes out across the continental United States, but the reality is that it seems the vast majority of the $1.5 billion from this project will never come to Hawaii. 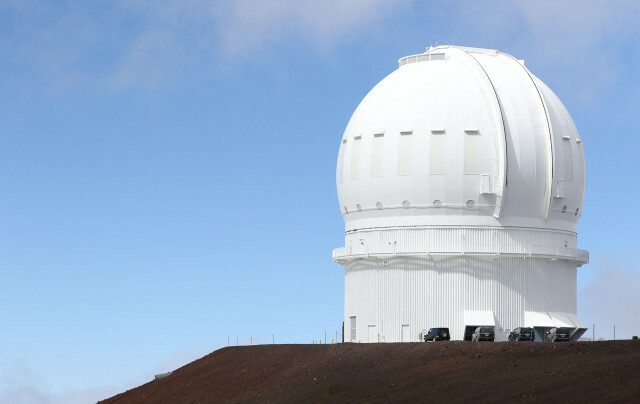 Building TMT would require Hawaii absorbing an irreparable loss for very little gain. At its core, the conflict over Mauna Kea is the oldest type of conflict there is in Hawaii: the fight over land. It’s Hawaiians and their allies standing firm to protect the resources that have been under their stewardship for centuries against the might of outsiders who want to use those resources how they think best. The conflict is not very different today than it was in 1893. As the population grows and resources continue to decrease, we, as a community, are going to have to make many hard choices. Mauna Kea is only one of those wicked problems. There will be more, and they will be harder, so it is important for us collectively to resolve this conflict. How this story ends will tell us everything about who we are today and who we will be in the coming decades. Mauna Kea is an opportunity for UH and the State of Hawaii to prove they are truly committed to not only Native Hawaiians, but genuine conservation and the intangible cultural resources that make Hawaii extraordinary. Let us only hope that university and state leaders quickly realize that Mauna Kea’s greatest potential will not be found beyond the stars, but right here in our islands as an immaculate and majestic landscape.